We went to the Lake recently, and I visited Swallow Falls a few times with friends and family. I went with Owen. Miles took a great picture of Owen at Swallow Falls last summer. There are two falls there. One is a gradual cascade and the other is a steep drop. The cascade falls, Swallow Falls is a great place to swim and get pummeled by the water. Miles stood to the side and Owen looked downstream in the rush of water. My family has been visiting Swallow Falls State Park for many years. My grandparents visited it in the 1940s during the summer vacations. A few years ago, I scanned a bunch of color slides from my grandfather’s collection. My aunt had them. She died and in the distribution of her belongings, I came into possession of these pictures. 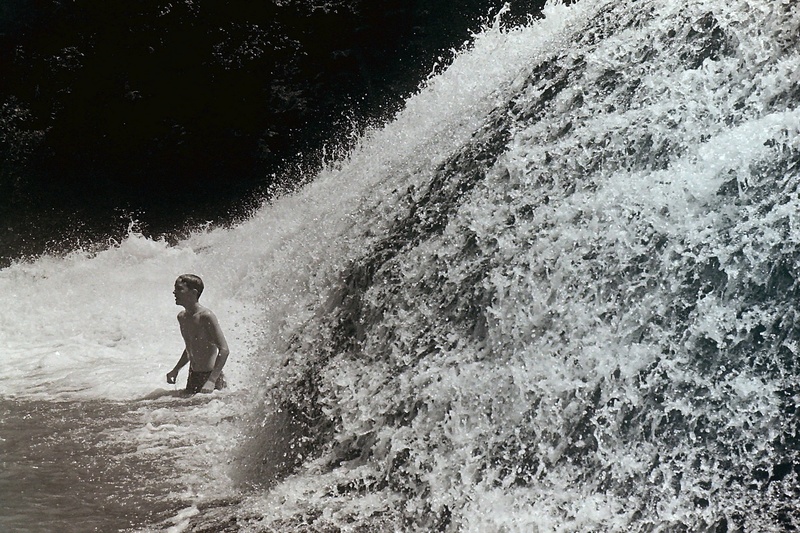 Among the slides, there were pictures of Swallow Falls in 1942. In 2012, I revisited the same places and stood in approximately the same places as my grandfather and took the same pictures. We both visited the falls in August. The water level is different– it was higher when my grandfather visited that day in 1942– but otherwise they look the same. I went back to Swallow Falls with Owen, one year after we visited with Miles. I will go back. He will go back. People will teem among the rocks and rivulets for many many years. My grandfather took his pictures. Miles took his. I will take mine. Steve and I listened to Ragged Glory a lot. I got a copy for myself and I have listened to it in binges many times. The tone of the album reminds me of being young in Morgantown. Staying late at the library. Keeping long hours on rooftops and in smoky apartments with Nancy, Howard, and Alison. Arguing over the Civil War. Walking on the old railroad tracks in the summer heat to the arboretum. Spending a whole day walking and stopping here and there to look at the river or contemplate a new direction. Me, ignorant me alone in the haze of my younger days, oblivious to much except the next phase of the day or the work of the coming week. Papers, tests, presentations. This song reminds me of all the time I wasted, my time well spent doing nothing or figuring out how best to do so. I’m dedicating this post to Sarah, the friend who invited me to start this blog last year. It has helped me in many ways, many unexpected ways. I met Sarah a few weeks ago on her trip to visit a shaman in Philadelphia. We had lunch. In the hour or so we had remaining, we found the Liberty Bell. We waited in line with a bunch of people from Alabama and took pictures of the bell. It was nice to meet Sarah in person finally after several years of online “hi” and “how are you.” I had the best egg sandwich I’ve ever had for lunch and we talked about the past, the present, and the future. I articulated some things for her in our conversation that I had not spoken aloud to anybody before. It took our conversation to foreground my thoughts and make them whole through my explanation. I told her I don’t have beliefs and I’m not sure why we insist on beliefs. I just have my imagination. That’s enough for me. It sustains me.